Specifically designed to meet the varied demands of ski alpinism, the Procline FL Pants provide performance and freedom for rigorous ascents and technical descents. The Burly Double Weave softshell is rugged and weather resistant, but still delivers the performance stretch and air permeability necessary for comfort on steep, technical climbs. The Arc'teryx Trim fit employs a straight leg that minimizes bulk for a clear line of sight to the feet. The fit also keeps the material close to the body to help maximize moisture transfer while leaving room for light thermal layering. Aggressive articulation is built in, a requirement particularly necessary on challenging ascents and steep ski descents, and includes a stretch gusset made from highly breathable Fortius 1.0 softshell for next level comfort and freedom. The cuff represents the Procline FL's commitment to use specific versatility. Realizing different situations often mean different boots, Arc'teryx designed the cuff with an integrated gusset. This gusset provides the adjustability required to create a secure fit over a range of boot volumes and collar heights. Designed to help ski mountaineers move faster and lighter, features are mission specific and purposeful. 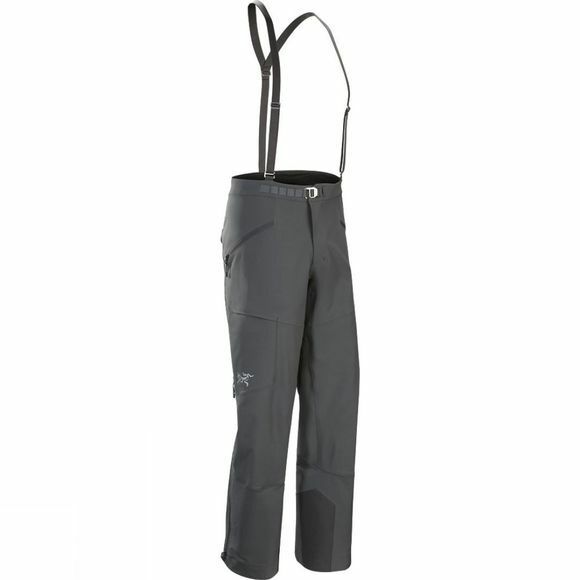 Side zips provide rapid heat dump, and have mesh backers that prevent snow from entering the pant leg. A dump pocket on the thigh is easily accessible while wearing a harness, and two zipped hand pockets lay flat to stay out of the way while climbing. A Keprotec patch helps protect the cuff from ski edge and crampon cuts, and durable 100-denier Cordura PowderCuff creates a seal at the boot cuff and holds tight with gripper elastic. The waistbelt adjuster is glove friendly, and the suspenders are removable. Both are designed with a low profile to perform under a harness.